Shortly after the release of a newly-declassified U.S. intelligence report on the use of chemical weapons outside of Damascus, Syria on Aug. 21, President Obama on Friday said, "this kind of attack is a challenge to the world." 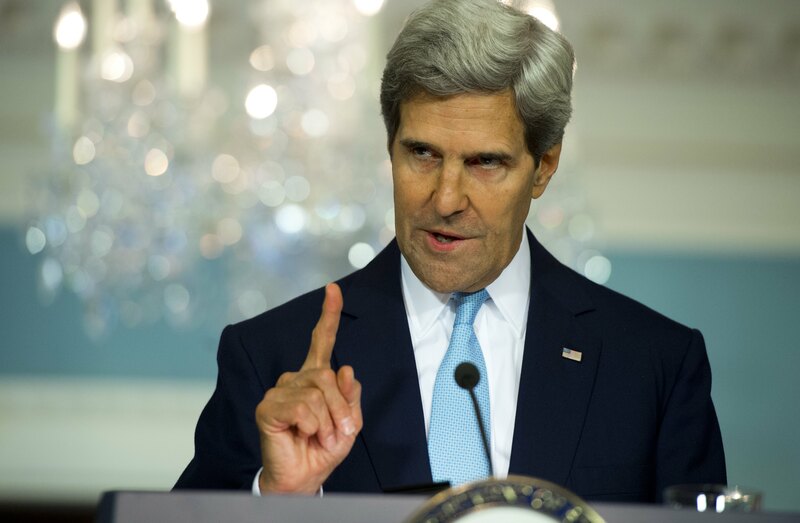 Earlier Friday afternoon, Secretary of State John Kerry laid out the details of the report. The findings suggesting that Syrian President Bashar al Assad's regime was responsible for the attack, Kerry said, "are as clear as they are compelling." Mr. Obama, addressing reporters at the White House before a meeting with Baltic leaders, repeated that he has yet to make a decision as to how to respond. However, he asserted, "I meant what I said: the world has an obligation to maintain the norm against the use of chemical weapons." The president pledged that if the U.S. takes military action, it would be a "limited, narrow act" that would not involve boots on the ground or a long-term campaign. Obama: Nobody "more war weary than me"
Kerry: Syria response "matters in real ways to our own security"
Kerry assured the American public on Friday that the Obama administration is taking "unprecedented steps" to declassify information and let people "judge for themselves" the evidence. "Our intelligence community has carefully reviewed and re-reviewed information regarding this attack," Kerry said from the State Department. "It has done so more than mindful of the Iraq experience. We will not repeat that moment." Mr. Obama similarly acknowledged the skepticism inspired by the misinformation that led to the Iraq war, adding, "nobody ends up being more war weary than me." "I recognize that all of us here in the United States, in Great Britain, in many parts of the world, there's a certain weariness given Afghanistan, there's a certain suspicion of any military action post-Iraq, and I very much appreciate that," he said, adding that his preference "obviously" would have been for forceful action from the international community to have already occurred. "On the other hand, it's important for us to recognize when over 1,000 people are killed... through the use of a weapon that 98 or 99 percent of humanity says should not be used even in war, and there is no action, then we're sending a signal that that norm doesn't mean much." Kerry said the findings suggesting that Syrian President Bashar al Assad's regime was responsible for the attack "are as clear as they are compelling." "I'm not asking you to take my word for it, read for yourself - everyone, those listening, all of you -- the evidence from thousands of sources, evidence that is already publicly available.... reached by our intelligence community about the chemical weapons attack." The declassified report says that the Aug. 21 attack killed 1,429 people, including at least 426 children. "Even the first responders, the doctors, nurses and medics who tried to save them, they became victims themselves," Kerry said. "This is the indiscriminate, inconceivable horror of chemical weapons." Kerry laid out the evidence, noting, "In all of these things that we know -- all of them -- the American intelligence community has high confidence, high confidence. This is common sense. This is evidence. These are facts." "We know that the Assad regime has the largest chemical weapons program in the entire Middle East," Kerry said. "We know the regime has used those weapons multiple times this year and has used them on a smaller scale but still has used them on its own people." He continued, "We know that the regime was specifically determined to rid the Damascus suburbs of the opposition and it was frustrated in doing so." Three days before the attack, he said, the Assad regime's personnel were making preparations for chemical weapons use and were told to take specific precautions like putting on gas masks. "We know where the rockets were launched from and at what time, we know where they landed and when," Kerry said. "We know rockets came only from regime-controlled areas and went only to opposition controlled or contested neighborhoods." The U.S. has also noted what how the Assad regime responded after the attack. The report says the U.S. intercepted communications from a senior Assad regime official who confirmed chemical weapons were used by the regime on Aug. 21 and was concerned United Nations investigators would find evidence. "We know this," Kerry said. The secretary of state also noted that he personally called the foreign minister of Syria to urge the regime to facilitate the U.N. investigation but that instead the regime shelled the neighborhood, delaying the investigation. "So the primary question is really no longer, what do we know," Kerry said. "The question is, what are we -- we collectively -- what are we in the world gonna do about it." Kerry forcefully laid out the moral argument for action and foreshadowed thelegal basis the Obama administration could use for a military attack, citing international norms and arguing why responding is in the interest of the United States. The use of chemical weapons has been a "clear red line for the international community" for nearly 100 years, since World War I, Kerry said, noting that more than 180 countries have signed the Chemical Weapons Convention. The attack he said, matters to the security of the United States' allies and to the credibility of the United States. "It matters because a lot of other countries, whose policy has challenged these international norms, are watching," he said, specifically calling out North Korea and Iran, as well as terrorist organizations like Hezbollah. "They are watching. They want to see whether the United States and our friends mean what we say." Mr. Obama similarly said the U.S. is considering a "limited, narrow act that would help make sure that not only Syria but others around the world understand that the international community cares about maintaining this chemical weapons ban and norm." Not responding, he said, "increases the risk that chemical weapons will be used in the future and fall into the hands of terrorists who might use them against us." Kerry also said a response matters because of "who we are" as a nation, in spite of the current disinterest in becoming embroiled in another conflict. "We know that after a decade of conflict, the American people are tired of war. Believe me, I am, too," he said. "But fatigue does not absolve us of our responsibility... And history would judge us all extraordinarily harshly if we turned a blind eye to a dictator's wanton use of weapons of mass destruction against all warnings, against all common understanding of decency, these things we do know." If Mr. Obama decides to launch a military strike, he would most likely have to do it without the support of the United Nations and perhaps without backing from some of the United States' biggest allies. The British Parliament on Thursday voted against endorsing military action in Syria, all but assuring Britain would play no direct role in any U.S. attack. French President Francois Hollande, however, said Friday that France could still intervene militarily. Kerry said America "should feel confident and gratified that we are not alone in our condemnation and we are not alone in our will to do something about it and to act." He cited supportive remarks from France, the Arab League, the Organization for Islamic Cooperation, Turkey and Australia. United Nations inspectors are still investigating the Aug. 21 chemical weapons attack in the suburbs of Damascus but are expected to finish their probe on Friday and leave Syria on Saturday. Kerry noted that the U.N. does not intend say in its report who was responsible for the chemical attacks. A poll released Friday shows that half of Americans oppose taking military action in Syria, even in response to the use of chemical weapons. Fifty percent of Americans oppose military action, according to the NBC poll conducted August 28-29, while 42 percent support it. Most Americans -- 79 percent -- say Mr. Obama needs to receive congressional approval before taking any military action. Congress isn't set to return from its summer recess until the Sept. 9, but the administration has consulted with the legislative branch. High-level administration officials on Thursday evening held a conference call with congressional leaders aimed at updating lawmakers on the situation and soliciting their views on possible military action. A number of members of Congress said after the call that the U.S. cannot stand by while the Assad regime allegedly uses chemical weapons. Thursday's "briefing reaffirmed for me that a decisive and consequential U.S. response is justified and warranted to protect Syrians, as well as to send a global message that chemical weapons attacks in violation of international law will not stand," Sen. Robert Menendez, D-N.J., chairman Senate Foreign Relations Committee, said in a statement. Sen. Bob Corker, R-Tenn., the top Republican on the Foreign Relations Committee, said in a statement, "While I'm opposed to American boots on the ground in Syria, I would support surgical, proportional military strikes given the strong evidence of the Assad regime's continued use of chemical warfare." He also said the administration would be "better off" seeking congressional authorization to use force, "which would provide the kind of public debate and legitimacy that can only come from Congress." Some other members of Congress have stated their opposition to any military action at this point. Rep. Tammy Duckworth, D-Ill., a war veteran who lost both of her legs in Iraq, said in a statement, "Until I feel it's imperative to our national security, I will not support preemptive intervention in Syria." Sen. Rand Paul, R-Ky., said on Fox News on Thursday, "I will do everything I can to stop the president. We should not engage in a war, and we shouldn't engage in it in an unconstitutional fashion."